Two of my four children are now in school. One is in kindergarten and one is in 1st grade. Each of them have a folder that they bring home that contains their daily homework assignments, notes from the school, and also completed classwork and homework from the previous day. On average they bring home about 10 sheets of paper everyday. Most of it I just throw away without even looking at it. Yeah, I know… I am one of those bad moms who just doesn’t care to know every single detail of what my child is learning. My 1st grader comes home with booklets of papers all stapled together going through EVERYTHING that they are learning and what they will be learning the following week and so on and so on. Don’t get me wrong, I am happy that the school is so efficient and detailed and take the initiative in keeping the parents involved, but I also think that there could be another way rather than wasting sooooo much paper. How about email??? 10 sheets of paper everyday means 70 sheets of paper in one week and 300 sheets of paper in one month, and 3,600 sheets of paper in one year! Craziness! Well, instead of immediately throwing all the paper away, I decided to create a space to keep it so that my children could use it as drawing paper. One side of the paper is usually blank so it is great to use for when the kids want to color with their crayons, markers, and colored pencils. How about you? 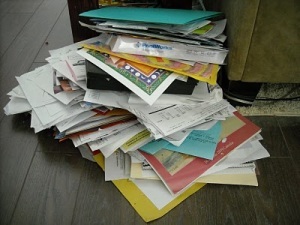 Do you get bombarded with paper from your child’s school? Do you take the time to read it all? Please share in the comment section below! We take one-sided papers of all sorts, pile a few, cut them in quarters, staple them in a corner and make mini note pads out of them. Three one-sided pieces of paper=12 page notepad….we usually do at least 5-8 pieces of paper (20-32 pages). These are perfect for keeping in your purse for emergency lists or something for the kiddo to draw on while waiting for something. I feel that way too with all the paperwork our children come home with. I just cleaned up their room that was just littered with school papers and most of them for fundraisers, sign up for sports and all kinds of other stuff. Everything just went in the trash. But you have a good idea there. Will try that out this week:) Happy Saturday!